I’ve been to New York many times, but until today I had never been to the top of the Empire State Building. Normally I visit the city on weekends, or even holidays like New Years Eve, and the crowds waiting to get to the top of the building are ridiculous. But today there were no lines and we were at the top in less than 15 minutes from the time we arrived. The 86th floor observation deck is the one that most people visit. However, I learned last night that there is a very small observation deck at the top of the spire on the 102nd floor. For an extra $15 you can go up there, and believe me, it is completely worth the money. While the 86th floor deck had around 200 people on it, there were only 5 people on the 102nd floor when we arrived. There were only 3 people there when we left about 45 minutes later. The view from up there is incredible. 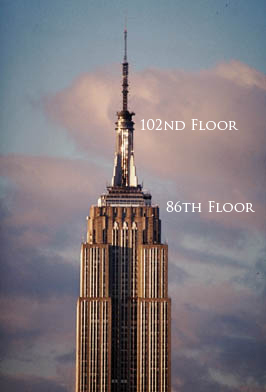 The 102nd floor was originally intended to be used as a landing platform for airships. The observation deck there was closed for several years, but re-opened in 2005. They plan to close it again soon to complete some renovations, but if you have the chance to go up there I highly recommend it. Oh yea, I am terrified of heights.